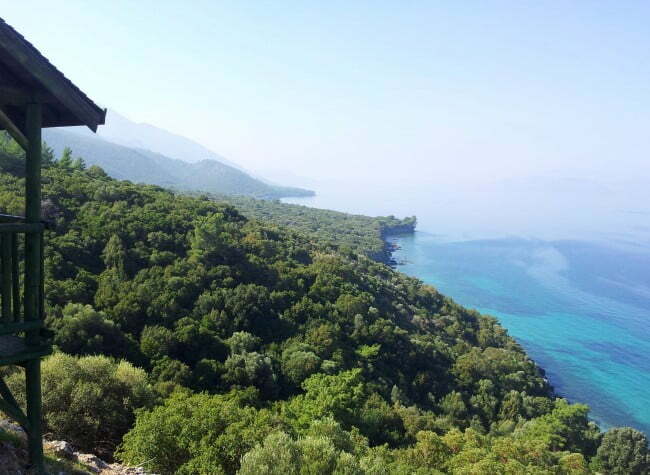 Sitting on the Aegean coast of Turkey, Dilek National Park is a protected green area and an all-rounder in terms of things to do. Gorgeous beaches attract swimmers and sunbathers while landscape photographers adore the scenery. Hikers love the extensive range of walking trails and an abundance of wildlife lures lovers of nature. I could return again and again to this mass of green land simply because there is always something new to explore. 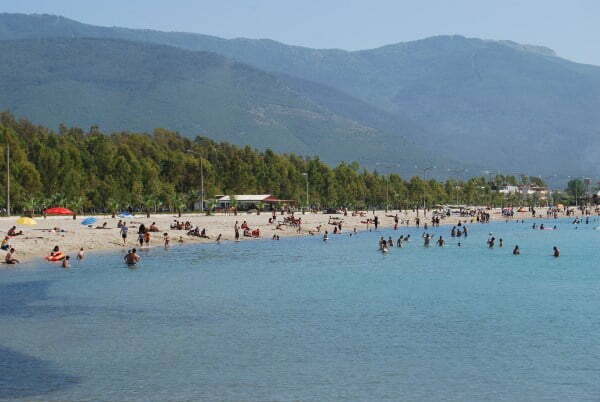 Also called Büyük Menderes Delta National Park, the 68,000 acres of green land is close to the holiday resort of Kusadasi, and to a lesser extent, Didim. Holiday giant, Thomas Cook works with many hotels in the region, providing foreign visitors with ideal overnight accommodation that is all within a short bus ride away from the park. 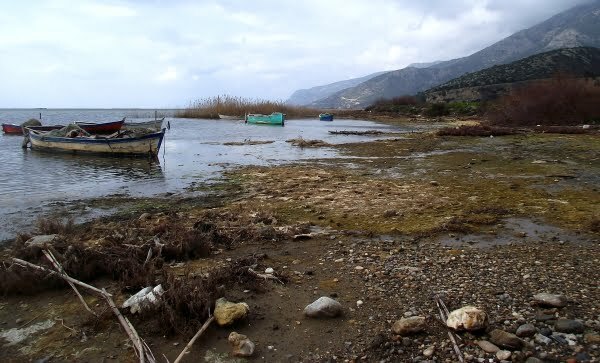 Within each hotel, are reps whose job it is to give information including how to reach Dilek Park and what to do there but also directly on the boundaries, is the small coastal village of Guzelcami which is a second home to many Turks who own holiday houses there. Therefore, the park does a superb job of attracting all visitors, both Turks and foreign. 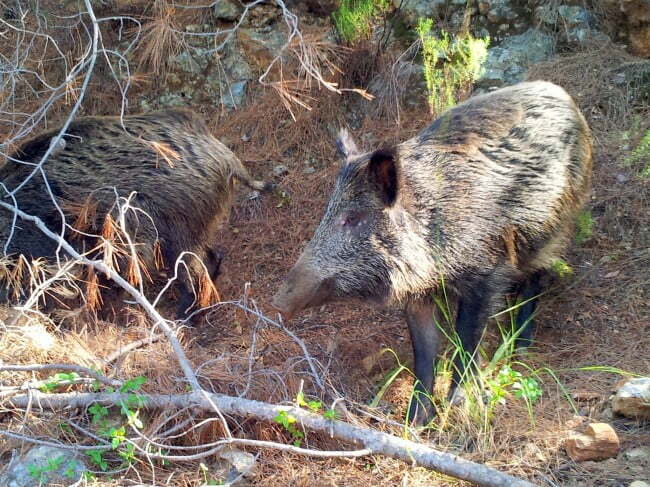 On one of my previous visits, I had two intentions of which one was to spot the local boars. This is always an interesting conversation to have with Turks because it is a pork product but yet widely hunted throughout Turkey. 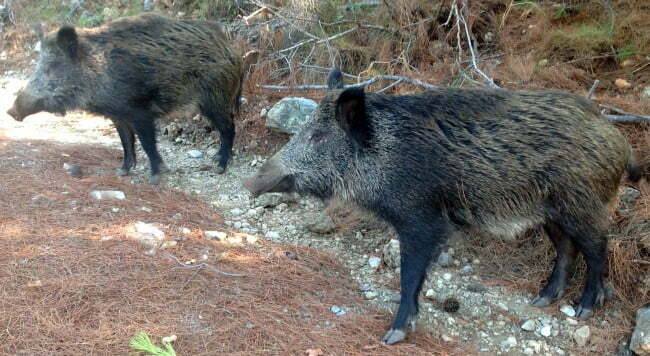 I’ve been told that some people in the Black sea region, hunt it because it is not haram to eat the boar while Turks on the Aegean coast, insist this is totally wrong and hunting should only be done for fun. Regional differences come to light depending on who you speak to, but one Turk made me raise my eyebrows when he said he knew someone who used to hunt the boars and sell it to local hotels to pass off as bacon. I’m not entirely sure if that is true, but it is irrelevant because I had no interest in killing one. I just wanted for the first time in my life to see one and that occasion was not what I expected it to be. Despite thousands of humans traipsing through the park every year, the two boars I saw were not used to human contact and backing away into the bush, made it obvious that they had no intention of sitting there playing at being cute animals. One sounded extremely agitated and made aggressive sounds hence my quick retreat back into the car. At that point, I had to remember I was in their habitat and not vice versa, yet in another area of Turkey, it is sad to read that wild boars stampeded through a luxury housing complex. What was the reason? Well, experts say we are tearing down their terrain so shouldn’t be surprised if they pitch up in our own backyards. Hopefully since Dilek National Park is protected by law that won’t happen. My second reason for visiting was to see the Cave of Zeus. If the truth is to be told, the name gives it a more majestic notion than its actual appearance. Greek mythology would have you believe that the name came about because Zeus hid in the cave when his brother Poseidon was on a tirade. Other more realistic people would say, the name was made up to attract tourists but since there is no entrance fee, I can’t see the point of that. Hidden from the main road, we followed a long path before arriving at a slippery slope that led down to the cave. The waters edge was filled with ragged rocks, leading to crystal blue water than a dark abyss at the back of the cave. It was actually quite small and I felt a twinge of regret at having bought into the hype of other websites. If you are in the region, then visit but don’t make a special trip to see it. Jeep safaris sold by holiday companies such as Thomas Cook stop here for a swimming break, but since I didn’t have my costume that was out of the question. Anyway, I assumed that its location hiding it from sunlight meant the water would be freezing. 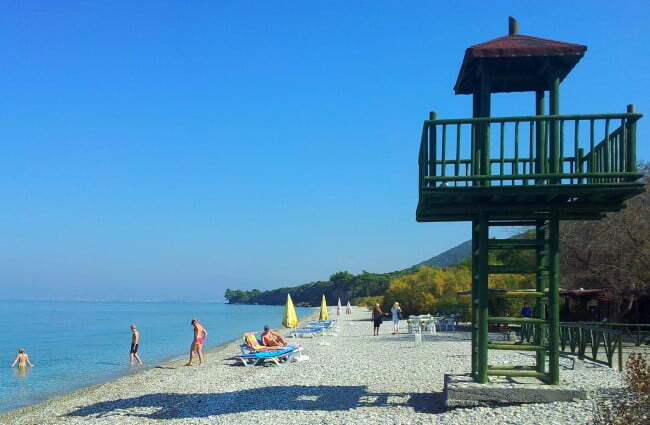 In summer, Sevgi Plaj (love beach)becomes the main destination for holidaying Turks from the big cities while, at the weekends, they visit from nearby areas like Soke to have a BBQ on the green area backing the beach. Silly me for questioning if this was safe, because even though it is dense with trees and grass, apparently it is too damp for a fire to start. Alternatively hire a car and also visit old Doganbey, famous for its small hillside village with Greek houses and a small museum displaying stuffed animals that lived within Dilek National Park (I checked and they were not killed specifically for the museum). 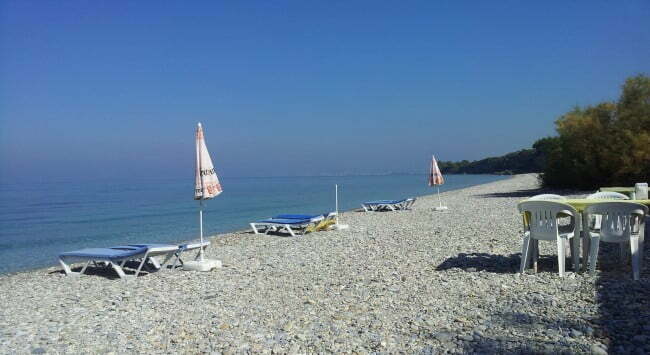 Nearby are popular fish restaurants that many people visit just for the melt in your mouth calamari. 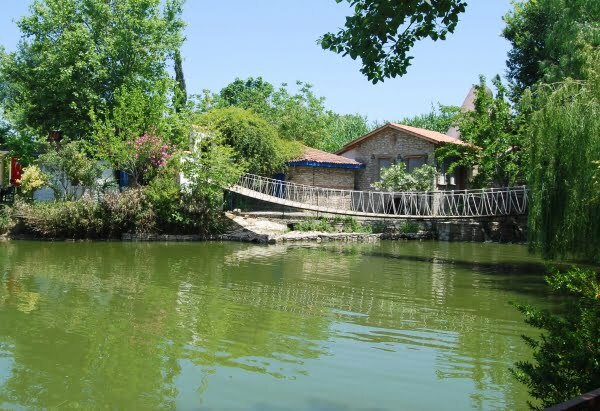 In the opposite direction, Degirmen Restaurant attracts families because of its small farm and likewise small lake, but it also has horse riding stables and at the entrance is the Olive Oil Museum, which is significant because along with Dilek National Park, the Aegean coast of Turkey is also famous for its miles of green olive groves .